My family has always eaten plenty of tuna. As a kid, I, however, did not. My discerning palate didn’t much care for anything outside of plain cheeseburgers, French fries, and pepperoni pizza. To me, tuna was something that came out of a small aluminum can and was then mixed with diced pickles and mayo. Under no circumstances could I imagine something that smelled so bad tasting good. Lucky for me, as I grew older my tastes changed as much as my body did. I decided I would try anything at least once. While I’m still not a big fan of the “chicken of the sea,” I’m forever grateful I was introduced to the grilled tuna steak. 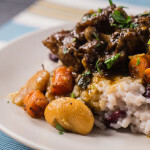 This recipe is now a staple at my house when high quality steaks are available. 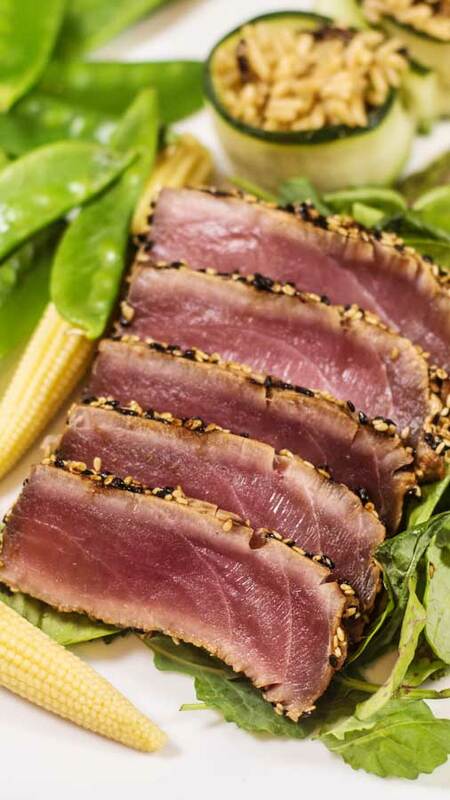 Simply put: Tuna steaks = tasty. Before I go any further, let me to stand on my sustainability soapbox for a minute. While I love tuna steaks, overfishing is certainly a concern to me personally. Tuna fishing can be highly destructive and impacts many other species that can be caught up in purse seine nets and longlines. Pole-caught yellowfin or bigeye tuna are best if you care about sustainability at all. Bluefin numbers are now low enough that they are on my “do not eat” list. It’s always a good idea to check with your local fishmonger about how the fish they sell are caught. I was certainly guilty of grabbing whatever was in front of me at the supermarket for a long time. I’m certainly still not perfect but I do want to be able to teach my kid how to cook these recipes in the future. 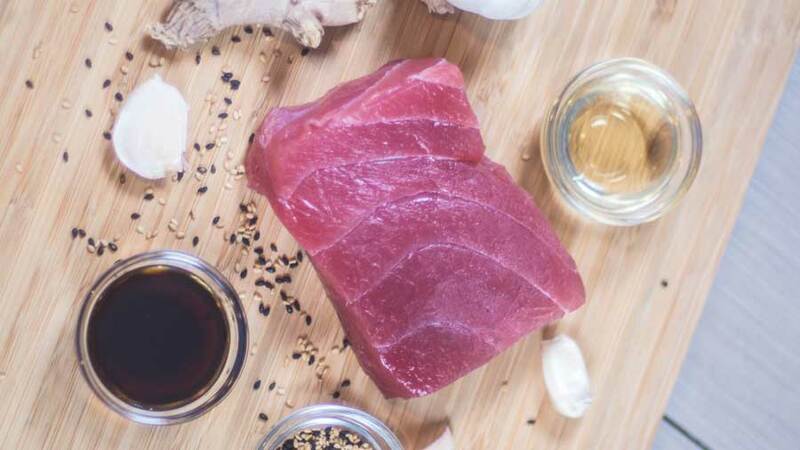 First things first, you’ll need to create a marinade for the tuna. It’s a pretty simple process: combine 1/3 cup of light soy sauce, 1/4 cup of sesame oil, 4 cloves of minced fresh garlic, and 2 tsp. of minced fresh ginger in a plastic re-sealable bag. Add the tuna steaks and try and get as much air out of the bag as possible. 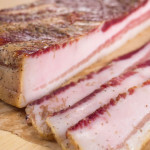 A vacuum sealer can make this step much easier. If you don’t have one simply remove as much by hand. It’s not the end of the world if you can’t get it all out. Multiply the marinade accordingly if you are cooking more than two tuna steaks. Let those succulent slabs of seafood soak up that flavor for 30 minutes. While the fish marinates, fire up your grill. 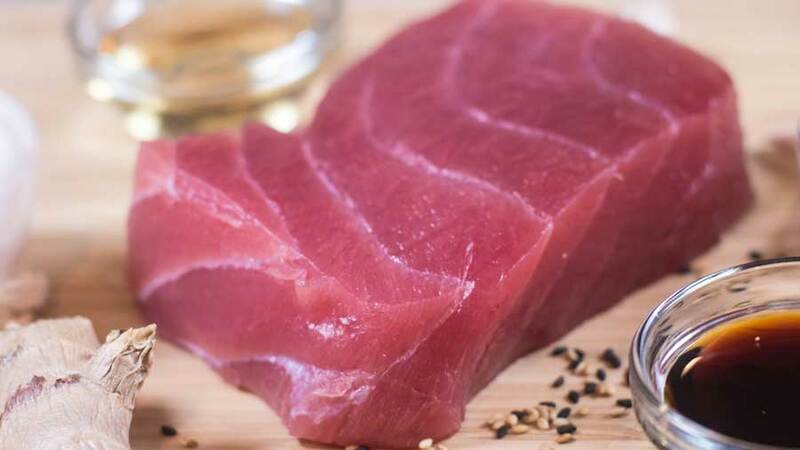 Cooking tuna is very much in line with how you would prepare a beef steak. 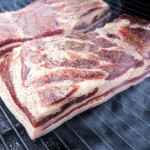 I like to set my grill at medium to high heat for a quick sear and use natural lump charcoal as it tends to produce a cleaner smoke that’s less likely to impart off putting or chemical tastes to the meat. It burns much hotter than briquettes to get a superior sear. If you have a gas grill that’s fine. I personally just like the taste of charcoal. Grilling the fish will go quickly as you really only want to go rare or medium rare on your steaks. 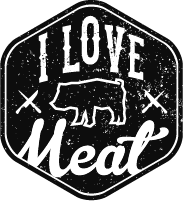 Just like beef you can cook out all of the flavor and juices if you cook it too long. 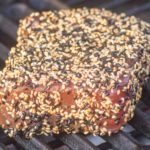 After the steaks are done marinating, remove them from the bag and sprinkle sesame seeds on a plate and coat the steak evenly. The excess seeds wont stick after you’ve coated it. I used a mixture of white and black roasted seeds this time for presentation. It’s now time to grill up the fish. Before you toss the tuna on that roaring fire, use a set of tongs and wipe the grill grates with a paper towel that’s been dipped in a bit of vegetable oil. This will prevent your tuna from sticking to it. Once wiped, place the steaks on the grill and cook each side 2-3 minutes depending on the desired internal cooked temperature. 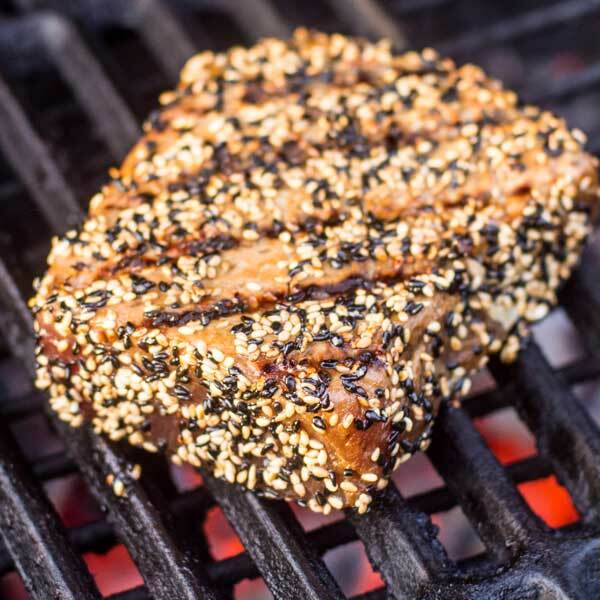 I strongly suggest you not walk away from the grill during this time, as it is very easy to overcook such a delicate piece of meat and burn the sesame seeds on the outside. When cooked, plate up your fish and serve with your favorite sides. I like rice with steamed baby corn and snow peas, and a little light soy drizzled on top. Enjoy. These succulent slabs of seafood will take your grilling game to a whole new level. 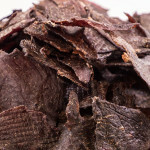 Combine all ingredients except the sesame seeds into a re-sealable plastic bag and marinade for 30 minutes. Heat your grill to medium high heat while you wait. After 30 minutes remove the steaks and discard the remaining bag of marinade. 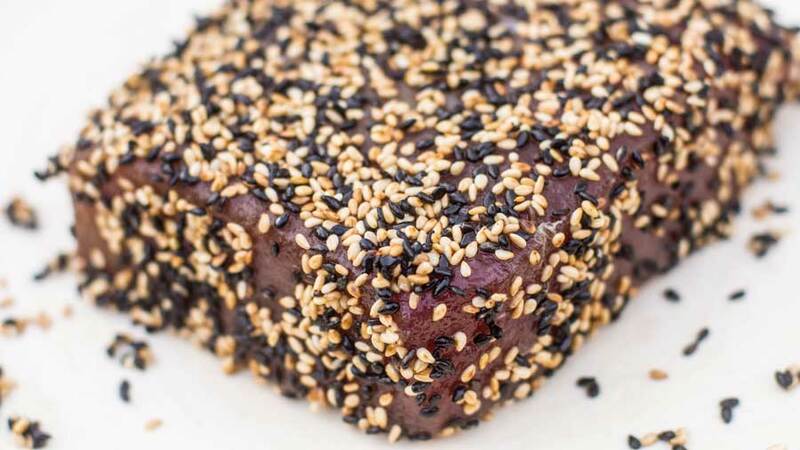 Sprinkle the 3 TBS of sesame seeds on a plate and roll the steaks around coating them evenly. 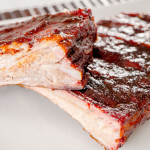 Using a pair of tongs wipe the grill grates with an paper towel thats had a few TBS of vegetable oil applied. 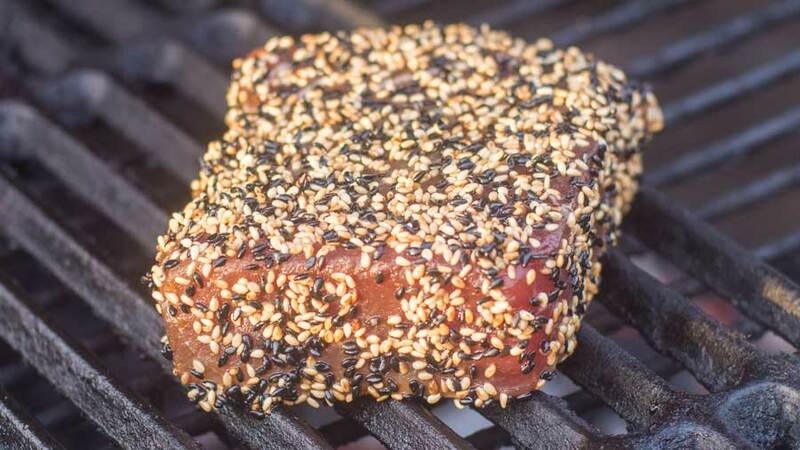 Grill steaks for 2-3 minutes per side being careful not to overcook the tuna or burn the seeds. Remove the steaks, slice, and enjoy.